Summer at Forsaken Lake by Michael D. Bell. Review: Do you enjoy books that are interesting, exciting, and suspenseful? Summer at Forsaken Lakeby Michael D Beil is interesting, exciting, and suspenseful book. Michael D Beil's book is just that. He crates suspense that will force readers to want to know more. In the story it says, "that house of Uncle Nick's and the lake - they're both full of secrets. You just have to know where to look. You never know what you might find." Beautiful lake, small town, and boats help create the setting where Nicholas and his two little twin sisters are heading to visit their Uncle Nick for the summer. While staying at his home, they find a secret compartment, but it is not just any secret compartment, it is a secret closet where they find a desk, a love letter and an unfinished film. Later on in the story Nicholas meets a girl named Charlie who helps him uncover the mystery surrounding the unfinished film. Will they solve the mystery before the summer is over? Thrilling, interesting, and suspenseful. 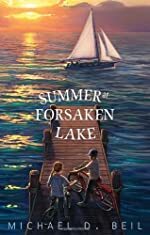 Summer at Forsaken Lake's setting in a small town, huge lake, and Uncle Nick's house help create a strong backdrop for the story. The characters are also interesting. For example, Charlie can throw a curve ball that will literally go around a curve of a wall. Also Nicholas looks exactly like his dad, which makes Charlie's mom scared. The book has a strong moral, sending the message that you should never be jealous because jealousy ruins your life as you become overcome with a desire to seek revenge. Revenge will always lead to something bad. Michael D. Beil also uses engaging language to create suspense. For example, Nicholas, Hetty, and Hayley go out into the night sailing while it is raining at top power and waves as furious as a lion crash on the shore. "Get your foul- weather gear on girls there's sail boat out there and it's in trouble. The mast is broken, and they're just drifting. Somebody might be hurt. They're waving a flashlight around, and we're the only ones that can help right now." I found myself wanting to keep reading because I could not wait to know what would happen next. Summer at Forsaken Lake is appropriate for all readers because it is just another great mystery everybody will enjoy. Summer at Forsaken Lake deserves 5 stars because it taught me to be kind to everybody because you will live a happier life if people will treat you the way you treat them. We would like to thank Random House for providing a copy of Summer at Forsaken Lake for this review. Have you read Summer at Forsaken Lake? How would you rate it?